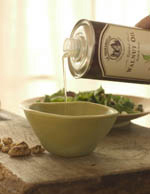 Mustard-Hazelnut Vinaigrette - A recipe from Savor California, the online showcase for extraordinary gourmet foods and beverages from California. Mix the mustard, shallot and vinegars together. Whisk in the oil and adjust the seasoning.